This glittering spider trinket box would be a lovely addition to a festive Halloween house, or a great gift for the insect lover in your life! 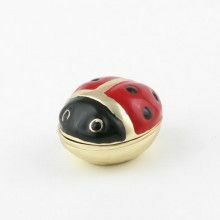 It has about a 2 1/4" diameter and has enough room inside for multiple pieces of jewelry, or other small knick-nacks. It is decorated with sparkling Austrian crystals; the spider with red and the web with mult-colored crystals. The gold plating really finishes the shiny nature of this keepsake!